I guess after posting about ABC, it reminded me of the other band that could have been their close cousins, Spandau Ballet. More white English boys playing black-influenced music, feathered hair, a saxophonist, live drummers, and banging 12" remixes. However, they differed in a few respects. While ABC's Martin Fry always seemed to have a wink in his eye and relish his cleverness, Spandau Ballet's lead vocalist Tony Hadley would rather croon in his powerful baritone. Fry masterminded ABC, while the engine behind Spandau Ballet were the Kemp brothers, guitarist Gary and bassist Martin. ABC employed strings and brass, while Spandau Ballet filled out with synths and jazzier motifs. Over the arc of both careers, I found Spandau Ballet was as consistent as ABC. While ABC's second album, Beauty Stab, was a disappointing flop, they got right back up again and reinvented their sound for How To Be A Millionaire. 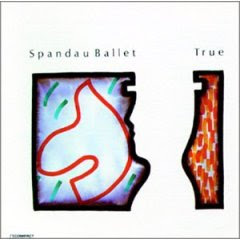 Spandau Ballet never replicated the success of the album True (and its title song), their following album Parade was practically a sequel, fairly close in quality. At first, Spandau Ballet were pretty much a UK sensation, the poster boys for the New Romantic movement, which I guess was another way of saying handsome English white guys making black-influenced dance music. The single "Chant No. 1 (Don't Need This Pressure On" was strictly a hit in New Wave UK and American clubs, a bit rough and crude, yet a catchy chorus. However, they fell in with the production team of Steve Jolley and Tony Swain, who really polished up their music, added a punchy compression to their mix, and upped their songwriting game, and that made all the difference. The album True was an international success, mostly on the the back of the title song, a six-minute New Wave ballad. When the song was a hit, I was assisting in Arista Records' A&R department on West 57th Street, often pointing out to the staff that the lyrics made absolutely no sense whatsoever. Then again, a lot of Spandau Ballet lyrics are a bit obtuse. Fortunately, "True" was the last song on a rather great album, full of tunes that rivaled any Duran Duran album at the time. Rising to the top was "Gold," which never quite became a hit here in the US, but was notable for having that one syllable hook of the title word ("Gold! "), hitting right on a jazzy minor ninth chord for it. luck has left me standing so tall-l-l-l-l-l-l. The give and take between Hadley, and the Kemp brothers' whispery coo's and echoes, with intensely ascending chords made for an exciting "building" effect. Jolley and Swain loved covering all the vocals in a wonderful warm reverb. A prominent Yamaha electric piano rolls chords and doubles the melody, even echoing the chorus later in the song. Tuned bongos synched up just before the second verse. Jolley and Swain paid particular attention to separating all the instruments, giving the kick and snare a deep punch that you can even hear in the video below. 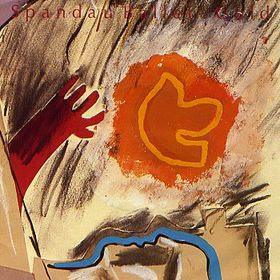 All the little things of this song worked: Hadley's dramatic rush into the word "Gold" while the Kemps hit it right on the downbeat, the weirdly off piano notes during the opening verse, squeezing the word "indestructible" into the chorus, the piano glissando just before the final chorus, and the minor chord motif that underlines the last few bars. When I see this video, I wonder what happened to Tony Hadley. He seems capable of pulling off a Rod Stewart and singing "the great American song book" and other classics to extend his career. Several years after True, the Kemps took a shot at acting and played the title characters in the brutal British gangster film "The Krays." Another ABC similarity: an album full of amazing 12" extended remixes. The "Gold" remix is also my favorite, a true tour de force that starts very mellow and jazzy for about a minute, then pounds in with the drums, tuned bongos and the whole shebang. It is almost like an overture leading up to Hadley's vocals, which drop in about three or four minutes into the mix.